Condo Culture | What’s the occasion? Gifts could be something they can use in the new house or gifts for elevating their happiness and wellbeing. Useful gifts are perfect for this milestone in life. So where do you shop? What retailer can you rely on for some of the most unique items in the market, items that not only are captivating and hard to come across, but something that signifies that precious connection you have to your new (and super pumped) condo home buyer? Home Sense, Sears, The Bay, Walmart, LCBO (everyone likes a little vino, right?) Those are some pretty big names that carry some pretty cool items but (yes, there’s a but) the thing is, everyone can get their hands on them. While bringing Condo Culture to fruition about 4 years ago, we put some serious thought into the brokerage, branding and culture, and decided to put together an awe-inspiring storefront that caters to these exact situations. We wanted to make sure that whether it be a gift for a birthday, a new home, a loved one “just because” or a gift to yourself, you’d be walking out of Condo Culture with a perfect lifestyle décor piece specializing in contemporary designs for modern living. Now we’ve focused on housewarming gifts, but what about hostess gifts or client appreciation gifts? No matter the occasion, brands such as Paddywax, Smeg, Klippan and Studio50 are just a few reputable names that have hit our shelves and left quite an impression. We’ve got tons of awesome merch in store, but we decided to make it easy for you by highlighting some of our favourite products and couple things that make them the perfect gift for any occasion. 1- Verbena and Lemongrass Soy Wax Candle and Incense: Perfect addition to a relaxing bath night- incense and hand poured soy candles made from recycled wine bottles. They also have easy peel off labels, great for reuse purposes! As for the scent, it’s addicting. 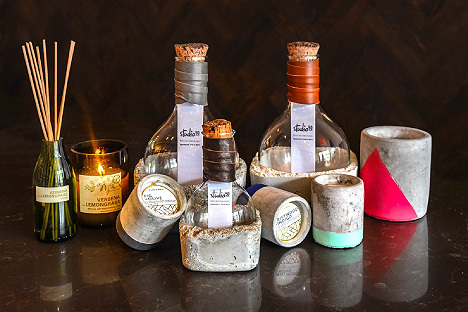 2- Paddywax Candles: Every mood deserves it’s own scent, from Sea Salt+Sage and Salted Grapefruit to Fig+Olive and Driftwood+Indigo, these concrete Urban 3.5 oz or 12 oz. candles make the perfect accent for any style of décor. 3- Studio50: On the dock, on the deck or at the patio table, the Rock Bottom Collection will keep your drinks chilled or steamy hot. An sophisticated one-of-a-kind gift that any homeowner would proudly display in their home. Before you put your phone down and head out this Friday evening, we’d like to leave you with a golden nugget to keep in your back pocket; the happiness you get from opening a gift is only temporary, for giving provides a more self-fulfilling experience that lasts for a long period of time. Whether it's from the CC store or not from a store at all, aspire to be a giver, a giver of love, a giver of strength and when you’re searching for the perfect gift to give a friend, coworker or loved one- you know CC has your back. In fact, mention this post at your nearest COndo Culture location this weekend and receive 20% everything in-store!